Café Pasqual’s is a Santa Fe dining destination. Chef/owner Kathrine Kagel has been feeding Santa Feans and visitors since 1979. The popular eatery, committed to organic food and creative cookery often has a line out the door. Kagel calls her approach to food sourcing, “Never, ever,” meaning that no chemicals, antibiotics, hormones or anything artificial are ever used in Café Pasqual’s food. If you believe that you are what you eat, your body will thank you for fueling up here. Even the wine list reflects her commitment to organic sourcing. Menu: Kagel, who’s been called the “Alice Waters of Santa Fe,” has created a menu that taps into culinary traditions from around the world. “The menus are in constant motion, from specials to sides to actual entree changes as the seasons evolve, and as our interests in new dishes evolve,” Kagel once told me. 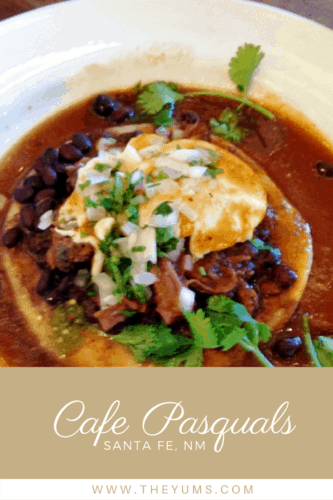 Café Pasqual’s serves breakfast lunch and dinner. The diverse menu, with enticing options for carnivores, vegetarians and vegans alike, is influenced by the cuisines of the Americas, the Caribbean, Asia, and Africa. Some café favorites always remain on the seasonally-changing menu. Depending on the season, daily specials reflect what’s available and what speaks to the chef. Portions are ample; if you’re a light eater, some dishes are available as half-orders. Breakfast: The eclectic menu offers New Mexican favorites such as breakfast burritos and huevos rancheros alongside the Mexican-inspired Huevos Motuleños and my favorite: Huevos Barbacoa con Chile d’ Arbol Salsa (I order a side of tomatillo salsa with it). You’ll also find classic favorites such as cheese blintzes and both corned beef and smoked-trout hash on the menu. Lunch: The lunch menu offers sandwiches, salads, Mexican favorites, and burgers. Tip: the chile-rubbed bacon on the BLT is to live for. Dinner: Some dishes, including Yucatan Cochinita Pibil, Plato Supremo (a combination plate), the double lamb chop, Mole Enchiladas, and carne asada are always on the seasonally-changing menu. Thoughts: Café Pasqual’s is a must addition to a Santa Fe dining itinerary for serious foodies, people committed to organics, and people who just like well-prepared, creative food. Even the wine list has organic offerings. The small, packed dining room seats 48 (including their community table) and you may know your neighbors before your meal is over. The restaurant’s slightly-raised front section is a bit more spacious. Décor is right out of Mexico: colorful papel picado, piñatas and whimsical paper mache pieces from artist Rick Phelps hang from the ceiling. Wonderful murals from Oaxaca painter Leovigildo Martinez decorate one wall; colorful Café Pasqual’s calendars hang over the windows and host stand. While Café Pasqual’s takes dinner reservations (during summer and holidays make them at least a few weeks in advance to get a prime-time table) lunch and dinner are first-come-first-served and unless you arrive when they open in the morning you’ll probably have a wait for a table. Put your name on the list, ask how long the wait will be and spend time wandering the surrounding streets or head upstairs to Café Pasqual’s gallery where they show the work of 25 artists as well as micaceous clay pottery from Jicarilla Apache potters. Solo diners love the community table. Friendships and even marriages have begun over a shared meal there. Peruse the menu, ask your server questions; they’re friendly and knowledgeable and many have worked there for years. No matter which meal you opt for at Café you’re in for a treat! Not only is the food healthy, it’s delicious. Prices: Breakfast and lunch dishes range from $14 to $18. Dinner entrees are mostly in the high twenty-dollar range. The exceptions: Grilled Skirt Steak Carne Asada ($34) and the grilled double lamb chop ($39). Wine by the glass ranges from $11 to $14; bottles range from $28 to $128. Next Post Eating Italian at Cafe Veloce: Food, Wine & Motorcycles? All looks delicious Billie. Throw in the fact it is all organic fare and you have something special. I taste the difference when we spent a few months in a place like Thailand. The veggie lunches we eat at local haunts are all organic. No other way. And cheaper. Whereas the non organic fare from chain restaurants is more expensive. Opposite World compared to the USA LOL..